It has been suggested that Team Peugeot Total be merged into this article. (Discuss) Proposed since June 2018. Peugeot Sport is the department of French carmaker Peugeot responsible for motorsport activities. Peugeot 205 Turbo 16 Evo 2. Peugeot Sport was formed in 1981 under the name of Peugeot Talbot Sport, after Jean Todt, a World Rally Championship co-driver for Talbot driver Guy Fréquelin, was asked by Peugeot to create a sporting department for the PSA Peugeot Citroën group. The rally team, established at Bois de Boulogne near Paris, debuted its Group B Peugeot 205 Turbo 16 in 1984, and took its first victory in Finland in the hands of Ari Vatanen. 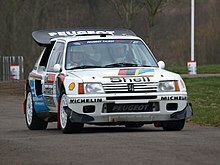 In 1985, Peugeot drivers Vatanen and Timo Salonen won seven out of the 12 rounds to give Peugeot the manufacturers' title and Salonen the drivers' title. Vatanen had been seriously injured in an accident in Argentina in 1985, so was replaced by Juha Kankkunen for 1986, who promptly delivered the team a second consecutive title. The FIA banned Group B cars for the 1987 season after the fatal accident of Henri Toivonen. This lead Peugeot to switch to rally raid, using the 205 to win the Dakar Rally for two consecutive years in 1987 to 1988, and then used the 405 to win in 1989 and 1990. Peugeot Talbot Sport also participated three times at the Pikes Peak Hillclimb Race in 1987, 1988 and 1989, winning the last two years, as well as in 2013 with the 208 T16. In endurance racing Peugeot Talbot Sport established their sportscar team at Vélizy-Villacoublay, France  and in 1988 launched the 905 project, to develop a sportscar to begin competing in the World Sportscar Championship in the 1991 season. The 905 was introduced in 1990, and finished second in the 1991 World Sportscar Championship season. In 1992, Peugeot Talbot Sport won the 24 Hours of Le Mans, with drivers Derek Warwick, Yannick Dalmas and Mark Blundell. They also won the World Sportscar Championship, thanks to Warwick, Dalmas, Philippe Alliot and Mauro Baldi. The championship did not run in 1993, but Peugeot were able to take a 1–2–3 finish at the 1993 24 Hours of Le Mans, with Éric Hélary, Christophe Bouchut and Geoff Brabham driving the winning car. Peugeot Talbot Sport subsequently pulled out of sportscar racing. Jean Todt, meanwhile, left Peugeot for Scuderia Ferrari. Peugeot switched to Formula One for 1994, using a similar 3.5L V10 engine as found in the 905. This was easily developed to be used by McLaren in 1994. However, poor reliability led to the relationship ending at the end of 1994 after 8 podiums, zero victories and 17 DNF´s. This led to Peugeot supplying Jordan Grand Prix in 1995 and 1996 and 1997 with 5 podiums as best results, before supplying the new Prost Grand Prix team for the 1998, 1999 and 2000 seasons. After a pointless 2000 season where poor reliability matched with Prost inability to deliver a competitive chassis, plus having scored no wins since their debut, led to the French marque pulling the plug out of F1. The Peugeot engines were bought by an Asian consortium led by former F1 designer Enrique Scalabroni called Asiatech and used for two further years (in 2001 for Arrows team and in 2002 for Minardi team). The Asiatech engines were both reliable, powerful and were supplied at zero cost, but its poor driveability led to both teams replacing them in favor of more costly but more capable Cosworth units. Peugeot entered the British Touring Car Championship in 1992, preparing 405's for former champion Robb Gravett. The team was run in-house from the company's UK factory in Coventry. The 405 never won a race despite promising results in its four seasons of competition, before being replaced in 1996 by the 406. Unfortunately Peugeot UK did not share any technical data with its European contemporaries, and the BTCC programme suffered. Peugeot handed the works deal to Motor Sport Developments for 1997 and 98, but wins still eluded the team. With spiralling costs in the series, Peugeot withdrew from the BTCC at the end of 1998. With his Peugeot 406, Laurent Aïello won the 1997 Super Tourenwagen Cup season. The Peugeot 306 GTi won the prestigious Spa 24 hours endurance race in 1999 and 2000. Peugeot won five times the Danish Touringcar Championship, with both the Peugeot 306 -winner in 1999, 2000 and 2001– and the Peugeot 307 winner in 2002 and 2003. Peugeot has been racing successfully in the Asian Touring Car Series, winning the 2000, 2001, and 2002 championships with the Peugeot 306 GTi. In 2001, Peugeot entered three 406 Coupés into the British Touring Car Championship to compete with the dominant Vauxhall Astra Coupés. 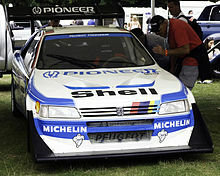 However, the 406 Coupé was not competitive, despite some promise towards the end of the year, notably when Peugeot's Steve Soper led a race only to suffer engine failure in the last few laps. The 406 Coupés were retired at the end of the following year and replaced with the 307—again, uncompetitively—in 2003. Peugeot has been racing successfully in the Stock Car Brasil series since 2007 and won the 2008, 2009, and 2011 championships. In 2013, the Peugeot 208GTi won a one-two-three at the 24 Hours Nürburgring endurance race. Marcus Grönholm driving the Peugeot 206 WRC to victory at the 2001 Rally Finland. In 1999, Peugeot Sport returned to the World Rally Championship with the Peugeot 206 WRC, under the guidance of director Corrado Provera. The car debuted at the Tour de Corse, with François Delecour driving one car and Gilles Panizzi and Marcus Grönholm sharing the second car over the remaining events. Grönholm finished fourth on the car’s third event, Rally Finland, before Panizzi finished second on Rallye Sanremo. In 2000, Grönholm gave the car its first victory at Rally Sweden, and followed this up with wins in New Zealand, Finland and Australia on his way to the Drivers’ championship. Panizzi won in Corsica and Sanremo, giving Peugeot the Manufacturers’ championship. In 2001, Didier Auriol joined the team, replacing Delecour as the main driver alongside Grönholm. Panizzi and Harri Rovanperä also drove additional cars for the team on selected events. Rovanperä won round two in Sweden, as Grönholm struggled with retirements during the first half of the year. Auriol won in Spain, Grönholm won in Finland, Australia and Great Britain, and Panizzi won in Italy. The team retained their manufacturers’ crown, even though Grönholm was the best placed driver in the drivers’ standings, in fourth place. Rovanperä was fifth, Auriol eighth and Panizzi ninth. For 2002, the team signed Richard Burns, the 2001 champion, from Subaru, replacing Auriol in the team. Grönholm won round two in Sweden, before Panizzi took back-to-back wins in France and Spain. Grönholm won the next event in Cyprus, before he and Burns were disqualified for a technical infringement in Argentina. Grönholm won again in Finland, while Panizzi won his third event of the year in Italy. Grönholm completed back-to-back victories in New Zealand and Australia to take his second drivers’ title. Burns finished the season fifth, ahead of Panizzi and Rovanperä in sixth and seventh. Peugeot were able to take a third consecutive Manufacturers’ title. The driver lineup remained the same for 2003, with Marlboro joining as title sponsor. Grönholm won in Sweden yet again, and took another two wins in New Zealand and Argentina. Panizzi picked up another win in Spain. Poised to rejoin Subaru in 2004, Burns was ruled out of action ahead of the final round of the season in Great Britain, having suffered a blackout while driving to the event. He was replaced for the event and the 2004 season by Belgian Freddy Loix. Burns finished the season fourth in the standings, ahead of Grönholm in sixth. Peugeot lost its manufacturers crown to Citroën. Marcus Grönholm driving the Peugeot 307 WRC on the 2004 Rally Monte Carlo. Peugeot introduced a new car for the 2004 season, the 307 WRC, which was based upon the coupé cabriolets version of the 307 road car. Having originally not been part of the team at the start of the season, Rovanperä replaced Loix after two rounds in the team’s second car alongside Grönholm, who struggled with the new car initially. He took the team’s only victory of the season in Finland, and he finished fifth in the standings at the end of the season. Peugeot finished fourth in the manufacturers’ standings. For 2005, Peugeot signed Markko Märtin from Ford to partner Grönholm. Once again, it took until Grönholm won Rally Finland yet again in August for the team to win. Two rallies later, in Great Britain, Märtin’s co-driver Michael Park was killed after the pair’s 307 WRC left the road. Märtin subsequently pulled out of the World Rally Championship. Daniel Carlsson and Nicolas Bernardi both filled in for him during the final four events. Grönholm took a second win of the season in Japan, on his way to third in the standings. Peugeot finished second in the manufacturers’ standings. At the end of 2005, PSA Peugeot Citroën withdrew its two teams from the WRC. Citroën took a year out to develop a new car and returned in 2007, but Peugeot did not return to the WRC. Peugeot Sport created the Peugeot 207 S2000, a rally car built to Super 2000 regulations. Peugeot Sport enter the cars, run by Kronos Racing, in the Intercontinental Rally Challenge (IRC). Peugeot drivers Enrique García-Ojeda, Nicolas Vouilloz and Kris Meeke won the IRC drivers' title in 2007, 2008 and 2009 respectively. It was replaced by 208 T16, which competes under R5 Regulations. Under the guidance of new director Michel Barge, Peugeot Sport returned to sportscar racing for 2007, taking on the dominant Audi with the Peugeot 908 HDi FAP. The car made its debut at the 2007 1000km of Monza, the opening round of the 2007 Le Mans Series season. The pairing of Marc Gené and Nicolas Minassian took the car to victory. At the 2007 24 Hours of Le Mans, Stéphane Sarrazin took pole position for the team ahead of the Audis. In the race, the #8 car of Sarrazin, Pedro Lamy and Sébastien Bourdais finished second behind the #1 Audi. After Le Mans, Sarrazin and Lamy took the Le Mans Series title for Peugeot. At the 2008 24 Hours of Le Mans, Peugeot and Sarrazin once again took pole position, locking out the first three places on the grid. In the race, the trio of cars finished in second, third and fifth. In the Le Mans Series, Peugeot lost out to Audi again, Minassian and Gené finishing in second place. At the beginning of 2009, PSA Peugeot Citroën made Citroën Sport director Olivier Quesnel the director of Peugeot Sport too. At the 2009 24 Hours of Le Mans, Sarrazin set his third consecutive pole position for the team. In the race, the team delivered its first Le Mans victory since 1993, with the trio of David Brabham, Gené and Alexander Wurz winning ahead of the car driven by Franck Montagny, Bourdais and Sarrazin. The team’s third car finished the race in sixth position. The team only contested one round of the Le Mans Series season, at Spa as preparation for Le Mans itself. Peugeot scored a 1–2 finish at the 2010 12 Hours of Sebring. However, reliability problems for the 908 at the 2010 24 Hours of Le Mans meant that Audi finished 1–2–3 at the race. At the 2011 12 Hours of Sebring, the older Peugeot 908 HDi FAP owned by Oreca Racing had a surprise win over the factory 908s and Audi R15++s. At the 2011 24 Hours of Le Mans, Peugeot saw itself in a position to win after two of the Audi R18s crashed; only a strong effort from Audi kept Peugeot from winning the race. The winning Audi was only 13 seconds ahead of the 2nd-place Peugeot 908. On January 18, 2012, Peugeot Sport announced its withdrawal from sportscar racing, citing lowering car sales and the economic downturn as reasons. A return, however, was not ruled out if funds can be procured for the future, but not likely before 2015. After Ari Vatanen and Bobby Unser, in the late 1980s, won the Pikes Peak Hillclimb Race, Peugeot Sport and Sébastien Loeb decided to unite their respective strengths and go for it. In April 2013, a 208 T16 was tested by Sébastien Loeb at Mont Ventoux. Loosely based on the shape and design of the production 208, the T16 is a lightweight 875 kg (1,929 lb) vehicle that uses the rear wing from the Peugeot 908, and has a 3.2-litre, twin-turbo V6 engine, developing 875 bhp (652 kW; 887 PS) with the aim of competing at the Pikes Peak International Hill Climb. June 30, 2013 saw this car demolish the standing record on Pikes Peak by over a minute and a half, with an overall time of 8:13.878. ^ "Motor Racing: Warwick on top of world". London: The Independent. August 31, 1992. Retrieved March 26, 2010. ^ "Victory and hat-trick of the 208 GTi Peugeot Sport at the Nürburgring 24 hour race". Peugeot Sport. Retrieved 2013-05-23. ^ Dagys, John. "Peugeot 908 Bids Farewell". SPEED.com. Archived from the original on February 6, 2012. ^ David Evans (April 23, 2013). "Peugeot reveals full spec of Loeb's 875bhp, 875kg Pikes Peak T16". Autosport. Archived from the original on May 5, 2013. Retrieved July 3, 2013. ^ "875bhp twin-turbo Peugeot 208 T16". Autocar. Archived from the original on May 28, 2013. Retrieved July 3, 2013. Wikimedia Commons has media related to Peugeot Sport.